Occupying the top 14 floors of the legendary Waldorf Astoria New York the Towers of the Waldorf Astoria New York is an intimate richly appointed luxury hotel with an exclusive entrance steps off Park Avenue in the heart of midtown Manhattan and truly the most exclusive luxury hotel in New York. 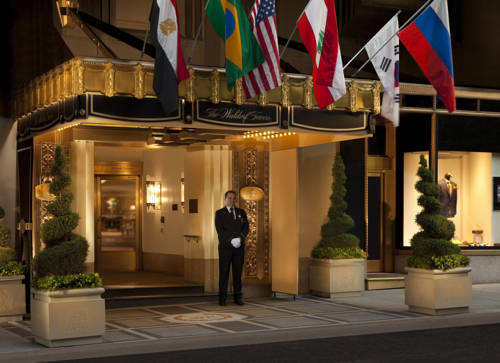 With residential-style apartment suites that are home to royalty world leaders and celebrities alike The Towers of the Waldorf Astoria is the ideal place to be in residence for both that important business meeting or relaxing weekend experience. Towers guests enjoy access to the Astoria Lounge on the 26th floor for Continental breakfast Concierge Services Theatre Desk Limo Service 24-hour access to the 19th Floor Fitness Center exclusive dining experiences and the Guerlain Spa with 15 individual treatment rooms. Credit card guarantee is required on all reservations. All reservations must be cancelled by 4pm host time the day of arrival unless a deposit is required. If this reservation was made electronically please cancel it electronically to avoid confusion and a no show bill. Policy is subject to change.